Chris Ford convenor Ukraine Solidarity campaign writes about a forceful campaign by miners in Ukraine and the lessons in provides a country torn by a toxic mixture of rising fascism, external interference and ethnic conflict. After being ignored for months, the miners of the Ukrainian industrial metropolis of Kryvyi Rih have had a breakthrough in their dispute with the corporate giant EVRAZ, securing a nearly 20% increase in their wages. Whilst it is short of their 50% goal it is a step forward and testimony to the effectiveness of international solidarity. This comes amongst a rash of workers protests in a number of cities in response to the crisis. Kryvyi Rih is an iron-ore mining centre in the Dnepropetrovsk oblast in central Ukraine. It is mostly a Russian speaking city, the region has a diverse Ukrainian, Russian and Jewish populace, many having relatives in Russia. Kryvyi Rih is a modern city of close to 1 million people, it houses the giant Kryvorizhstal plant owned by Dutch-Indian Mittal Steel. Its mine owners include the EVRAZ corporation, owned by Russian oligarchs. The inequity of Kryvyi Rih is straight from a 19th century novel, the oligarchs pay next to nothing in tax in Ukraine whilst offshoring vast sums, mostly in London. The top share-holder of EVRAZ is Roman Abramovich worth $14.2 billion, next in line Alexander Abramov is worth $7.5 billion. In proportion to the wealth and luxurious lifestyles of these corporate owners the misery of the miners stands in stark contrast. 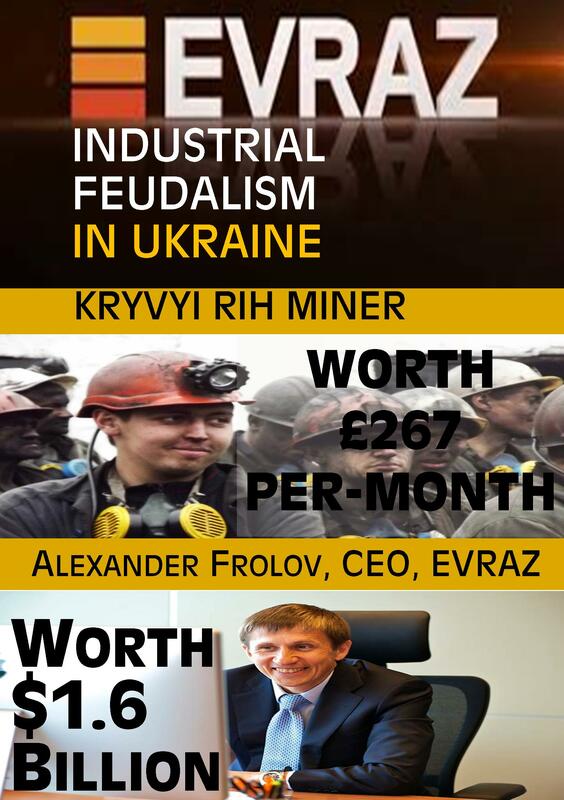 The average monthly salary at Evraz’s Sukha Balka mine is 5290 Hryvnia, a mere £262.85. Whilst a corporate gloss has been painted over the mines, with company uniforms, protective equipment and European safety policies the reality of working conditions is very different. Activists of the Independent Union of Mineworkers of Ukraine (NGPU) describe it as a “beautiful cover”, you are expected to “work at any cost, workers cannot refuse to work in dangerous conditions because they can be fired!” Two years ago there were twenty three accidents at the EVRAZ iron-ore mine alone. Yury Samoilov, Head of the NGPU at EVRAZ says that the “management work according to the laws of industrial feudalism”. The increased assertiveness by the workers to challenge the oligarchs began with the EuroMaidan rebellion against the authoritarian ex-Presidency Yanukovych. Whilst most coverage has focused on the events in Kyiv, the EuroMaidan was a diverse movement that arose across Ukraine, in Kryvyi Rih it was more proletarian in composition than populist. When the authorities turned to using thugs and armed snipers to confront their Maidan demonstration on 24th February, Kryvyi Rih did not witness the wholesale shooting of protesters as in Kyiv. The reason the hundreds of workers organised in self-defence brigades who prevented them from killing anyone. The next day hundreds of miners took over the chamber of the City Council demanding the councillors, who supported the pro-Moscow President Yanukovich, either represent the will of the people or resign. The miners responded to this situation with a claim for a 50% pay rise and a series of improvements to their conditions. NGPU began organising strike action, the restrictive Labour Code in Ukraine requires two-thirds support, and the trade union activists have working hard to collect 1,600 signatures to start of collective labour dispute. This activity was accompanied by a direct appeal for international solidarity, specifically calling “upon the workers of Britain for solidarity”. On 23rd May the United Steelworkers Union in Canada picketed the EVRAZ plant in Regina in solidarity with the Ukrainian miners, prompting the Vice President of Human Capital flying directly from the North American HQ in Chicago. This was joined by a protest at the EVRAZ London HQ by socialist and trade unionists of the Ukrainian Socialist Solidarity campaign on the same day. The demands for Justice for the Kryvyi Rih miners were also raised in the House of Commons in an Early Day Motion (137) by John McDonnell MP and in a the National Assembly of Wales tabled by Mick Antoniw. It has been the recent experience of workers power not military power that has shown the ability to overcome the divisiveness of chauvinists, and to unify workers around both goals of social justice and in defence of a united and multi-ethnic Ukraine. It is from these positive experiences that we can take hope in the developing Ukrainian labour movement.